CollegeDunia has everything sorted for you! The main homepage of the website is very attractive and there is a search bar right in the middle. So, you can easily search for the name of the college or courses. Overall, the design of the website is easy to understand and everything has been arranged into categories. 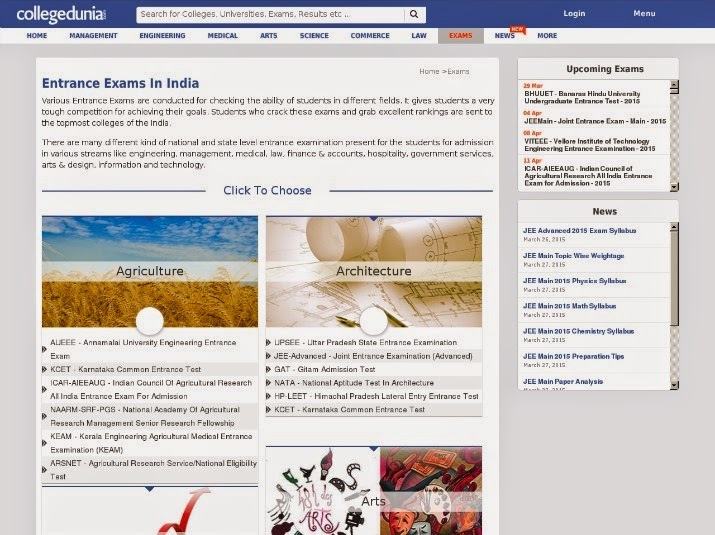 More than 15000 colleges are listed on CollegeDunia and it is India's most comprehensive college search engine. You can check out the college ratings, the statistics, the pictures and videos of the college along with the placements, courses offered and fee structure. the website loads very fast and you can get your facts straight. There is also an option to view the faculty. There is an EXAMS category, where you can checkout the top entrance exams going to be held in a particular year. there are a lot of exams mentioned on the website and it is very easy to navigate through them. Everything is in a list form, which makes it much more easier to search and find the best college for you. Not only this, CollegeDunia also gives you an option to view colleges in a particular state or city of India. So, you can view the top colleges in Pune, Jaipur, Kolkata, Chandigarh, Bhopal, Mumbai and many other cities. Suppose I search Anna University on CollegeDunia. Instantly, I can get Email contact information, the location of this University, the map showing the location and also categories. the categories include those of fees, gallery, news, placement and courses. For 2 year MBA course, Anna University, Chennai charges you Rs. 72000. I can view all this information right away! Very simple! Colleges and Institutes can contact CollegeDunia for listing their college on their website. CollegeDunia provides comfort to students, parents and teachers. Sitting at home, you can find out the top colleges and Institutes in India. Thus, overall, CollegeDunia is a website that I would use to find the appropriate college for my son. Would recommend this easy to use website to all my readers. Just check it out and you won't be disappointed. To the point and sufficient information has been provided about each college by CollegeDunia. About CollegeDunia : Collegedunia.com is wholly owned product of Collegedunia Web Pvt. Ltd. based in New Delhi. The website has been created to fulfill a vision of empowering students with knowledge so that they make a wiser decision while choosing their career and alma mater. Collegedunia.com is an extensive search engine for the students, parents, and education industry players who are seeking information on higher education sector in India and abroad. One can rely on Collegedunia.com for getting most brief and relevant data on colleges and universities. With the most interactive user interface and most validated content, we aspire to be the top education portals in coming days. Thank you so much for such a informative article. Please visit my blog www.jeemainsadvanced.com .